There are nuances to every buyer’s journey. However, the senior housing sales cycle is notable for its length. The average sales cycle for a new independent living resident is 120 days, making it unique both compared to buyer’s journeys in general (compare how long it took you to decide on that new coat last fall) and within the senior housing industry. For reference, the average sales cycle for an assisted living resident is just 70 days. While it is still important to maintain a traditional advertising presence to build awareness for your independent living community – through print ad placements, billboards, TV spots, or radio – inbound marketing can be a more effective tactic for nurturing these prospects along the path of a drawn-out buyer’s journey. 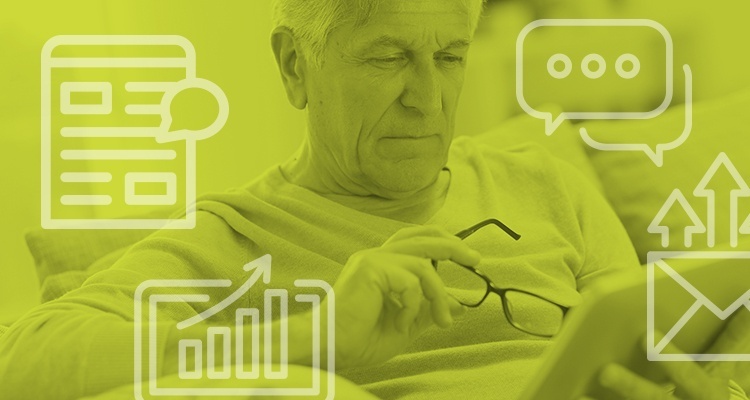 To develop strategies that effectively market to this audience and facilitate this unique sales cycle, you have to understand what makes independent living prospects different from other seniors, and how that shapes their buyer’s journey. When an independent living prospect first starts looking at your community, they may not have even decided that senior housing is right for them. They may still be weighing their options between staying where they are, downsizing to a smaller home or apartment, or moving into independent living. The reason the sales cycle moves almost twice as quickly for skilled nursing than it does for independent living is because there’s a higher level of care involved in skilled nursing, and therefore a greater degree of urgency propelling the move. For those looking at independent living apartments, a move to senior housing is not just a move to a new home; it’s a transition into a brand new life stage, and not one that everyone welcomes. This makes your marketing challenge twofold: 1) sell prospects on the idea of independent living in general; and 2) sell them on your community in particular. How do you do that? What are the benefits of senior living? Will I have access to care if something happens to me? What’s the community atmosphere like? Will there be social activities to help me make friends? Now, you might be thinking: How many seniors are actually going to search for information online? That answer might be higher than you think. Over 60% of seniors 65 and older use the Internet, and of those that do, 71% go online every day. And for every senior who hasn’t yet adopted the Internet, you can bet there’s an adult child going online to do extensive research on their behalf. You should be speaking to this dual audience (seniors and their adult children) across all your marketing efforts, but particularly online. An adult child would like to move their parent into a senior living community so that their parent can benefit from the built-in social network and they can rest easy knowing that their parent is in good hands. Their parent, however, resists the move. They have negative connotations about senior living and want to preserve their independence. The adult child goes online and finds a great article on your website about the benefits of moving to an independent living community. Thinking that a third party source might be more convincing than they are, they print out the article and give it to their parent to read. The parent is intrigued and asks for more information about the community. The adult child reaches out to the community to arrange an informational meeting. Presto, you have a lead. That’s inbound marketing for senior housing in action. If a prospect has been using your content as a resource throughout their decision-making process, who do you think is going to be top of mind when they’re ready to start setting up tours? That’s right: you! And when they already view you as a reliable resource before they walk in the door for their first tour, you’ll have less work to do in gaining their trust when it really counts – decision time. So, sit down with your marketing team and start brainstorming content ideas. Your sales team will be a great resource for insight into what topics are top of mind for prospects just starting the process of researching independent living options. From there, you can assign roles for your newly assembled content marketing taskforce, decide which content formats make the most sense for your audience (we recommend blogs and videos), and get to work. But it doesn’t end there. Once a prospect has opened a line of communication with you by signing up to receive your email newsletter or download a piece of content, it’s up to you to keep the conversation going. Reach out to introduce yourself and invite them to visit your community for a private tour. If they’re not ready to start touring communities, you can offer to send them more resources that will help inform their decision in the meantime. Lead nurturing is open-ended and will take different forms based on your sales style and the collateral your community has developed, but the common thread is that you’re continuing to strengthen your relationship with your prospect. In its ideal form, this ongoing relationship is mutually beneficial. By simplifying their decision-making process and shortening your sales cycle, you both end up happy. 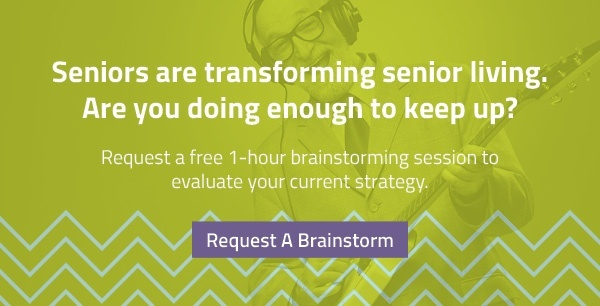 Schedule a FREE Senior Marketing Brainstorming Session with our Imagewërks team. Come in with your challenges—walk out with actionable strategies you can start using right away. Editor’s note: this post was originally published in April of 2017 and has been updated with fresh content.